Fuel level sensors measure the fuel level in the fuel tank. The level is indicated on the fuel gauge. To enable the display of the fuel level, an analog fuel level sensor is integrated in the fuel tank. On the float tube is a plastic float, which changes its vertical height depending on the amount of fuel in the tank. According to the position of the float, the electrical resistance is changed, which controls the display of the amount of fuel remaining. The float tube contains a series of reed switches. These switches are magnetically activated by the float. By this non-contact operation, mechanical wear is excluded. The downstream resistance matrix increases the accuracy of the level sensor significantly. A sturdy aluminium housing prevents mechanical damage during transport, installation and operation. DT® Spare Parts brand fuel level sensors have a high-strength corrosion-resistant and anodized aluminium housing. The float is made of durable, fuel-resistant plastic with moulded-in magnets. Fuel-resistant O-rings are used for the tank seals. Plug-in coupling ensures fast connection of the fuel lines. 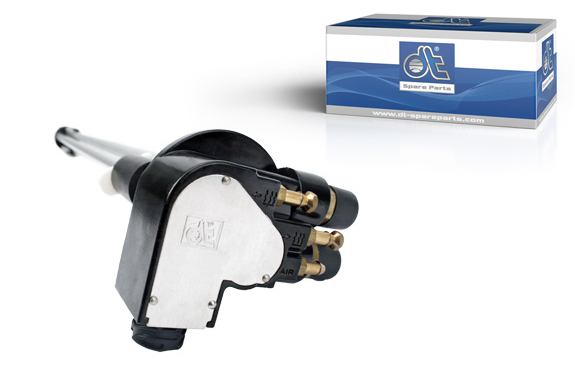 A perfectly-sealed electrical bayonet connector in accordance with DIN regulations ensures optimal transmission of the fluid level.